From left: John Bartlett, executive chairman of APH; Dan West, president of Action Sales & Marketing; Dave Berge, regional sales manager at BBB Ind. ; Joe Bergsieker, regional vice president of sales at BBB Ind. ; Glenn Barco, senior vice president of sales at BBB Ind. 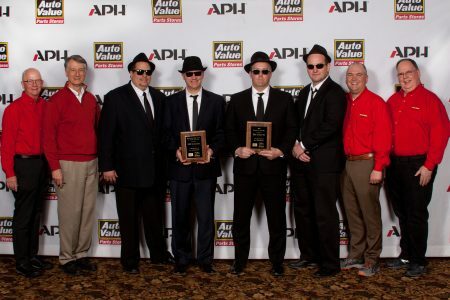 ; Jay Knopick, account manager at Action Sales & Marketing; Corey Bartlett, president and CEO of APH; and Rich Vierkant, vice president of merchandising at APH. APH recognized outstanding supplier achievements from 2018 with all of their store owners, managers and salespeople present at their annual Winter Conference held at Cragun’s Resort and Conference Center in Brainerd, Minnesota.